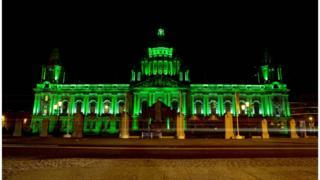 Unionist and Sinn Féin councillors have clashed over proposals to develop St Patrick’s Day celebrations in Belfast. The Progressive Unionist Party’s John Kyle told a meeting that too often the event is a cold house for unionists. Reservations were also expressed about attempts to follow other cities and dye the River Lagan green on 17 March. However, councillors unanimously agreed to reject a proposal to drop the annual St Patrick’s Day concert, which is staged at Custom House Square. The suggestion to scrap the gig was put to a vote after health and safety concerns were raised by council officials. Their concerns related to congestion as the 20,000-strong annual parade converged on a concert venue which has a maximum capacity of 6,000 people. The committee agreed that officials would look at re-routing of the parade and the timing of the concert to address officials’ safety concerns. The meeting of Belfast City Council’s growth and regeneration committee was presented with a report which examined how Belfast’s annual celebration could be expanded. The report was prepared by the group which organises the annual Féile an Phobail [Festival of the People] event in west Belfast. It highlighted the numbers of visitors attending St Patrick’s Day parades in Dublin, Chicago and New York and the level of public investment in those events. But a row broke out after a number of unionist councillors voiced concerns about the group’s proposals. Mr Kyle told the meeting he regretted that organisers of Belfast’s St Patrick’s Day events had not reached out to unionists. Jeff Dudgeon from the Ulster Unionist Party (UUP) complained that unionists felt they were being “bounced” into something. Tensions increased as a number of unionist councillors objected strongly to allegations of “racism” from Sinn Féin. The party accused unionists of being happy to support “Orangefest” in July, but reluctant to support the “greening” of Belfast on St Patrick’s Day. Speaking to the BBC after the meeting, Sinn Féin councillor Deirdre Hargey defended her party’s claim of racism. “I think there is a concern when we’re looking at the issue of St Patrick’s Day. “Irishness is celebrated everywhere else on the globe, except Belfast, and I do think that’s an issue that needs to be talked about, ” she said. But Mr Kyle rejected Sinn Féin’s allegations that unionists had been racist. “I think if we’re to make St Patrick’s Day a success, then there needs to be changes and we need to work to make it more inclusive,” the PUP councillor told the BBC. “For people to say ‘look, we are having difficulties and there need to be changes,’ and then to be criticised as being racist, I think was unfortunate but I think it was also wrong”. Ms Hargey told the BBC the presentation had suggested broadening the appeal of Belfast’s St Patrick’s Day event through sport, music, culture, arts and food. She said there were “positive steps” that could be taken. However, she added the growth of the festival was restricted by the fact that 17 March is not a public holiday in Northern Ireland and many people cannot participate when it falls on a weekday. The full report will be considered by the committee at a later date.